Prince George's County Fire Chief Benjamin M. Barksdale announced several promotions today. In making the announcement Chief Barksdale stated. "Please join me in congratulating 23 Fire/EMS personnel for their upcoming promotions or appointments. I look forward to speaking with each of the promoted employees in the upcoming days to congratulate each of them individually for this achievement. These promotions are a direct reflection of their hard work and their dedication to our Fire/EMS Department." Congrats to all for a job well done, and welcome to our new employees! 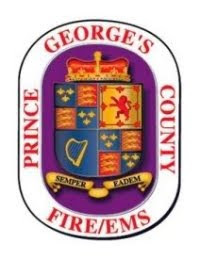 Prince George's County Firefighter/Medics will wear a different uniform shirt during the month of October. The standard blue t-shirt will be adorned with Breast Cancer Awareness messages. October is breast cancer awareness month. One in eight women will develop this disease in their lifetime, and 1,600 men will fall victim to breast cancer this year. On Friday, September 29, Fire Chief Ben Barksdale hand delivered three dozen shirts to be worn by personnel at the Brandywine Fire/EMS Station starting October 1. “I am proud of the Departments effort to help raise awareness of breast cancer as well as all cancers and the importance of early detection," said Fire Chief Barksdale. "I encourage everyone to wear a t-shirt and help us raise awareness. In addition to our t-shirts we utilize our pink fire and EMS units to help us raise cancer awareness year round." The Prince George's County Fire/Emergency Medical Services (EMS) Department will be continuing our annual campaign to raise awareness about breast cancer. For the seventh year, Fire/EMS Department members from our career, civilian, and volunteer ranks are being presented with the opportunity to show their support by wearing cancer awareness work shirts throughout the month of October. Through the life of our campaign, members of the Department have contributed tens of thousands of dollars to fund assistance, research, and screening in Prince George's County and surrounding areas. Members are encouraged to purchase and wear cancer awareness work shirts while on duty. To facilitate, I am again authorizing the change in work uniforms for the entire month of October so we may help to spread the valuable message of hope. All proceeds will be donated directly to breast cancer charities directly serving the residents of Prince George’s County through the Doctors Community Hospital Foundation, to fund programs through their Comprehensive Breast Care Center. Please consider helping to raise funds for breast cancer charities so they may continue the search for a cure. Continual funding is crucial to not only promote research, but to aid in education and prevention in order to save lives. In 2016, PGFD suffered a Line of Duty Death when Chris Hill passed away from an occupational form of brain cancer. Amy Hill (Chris's daughter) designed the heart on the front of the shirt. She added Fire Fighter Kathleen Murphy Martell’s ID number to the ribbon that surrounds the heart.